Last article was about IMSI, TMSI and GUTI, and how they are created, it was also mentioned there that GUTI is used in handover (HO) procedure. I thought that today is a good time to say few words about handover. There are two general types of handovers in LTE. In this article I'm going to describe only X2 based HO and to be perfectly honest with you I have to admit, that I will publish information about X2 based handover with case where no SGW is changed. For others types please look for different article (After publishing articles describing other HOs I will update this line with direct links. [Update-16-03-2012] First one is X2-based handover with SGW relocation). All of this information you can find by yourself just by reading 3GPP TS 23.401. As always it's good to start with general picture, so here it is. As you can see, green arrow is demonstrating UE movement between two eNodeBs controlled by the same MME. Such procedure as you should know is called a handover. In this procedure every bearer set between UE and PGW will be moved to new eNodeB(if target eNodeB is able to handle them). Please see below general description of X2-based handover according to specyfication. These procedures are used to hand over a UE from a source eNodeB to a target eNodeB using the X2 interface. In these procedures the MME stays unchanged. Two procedures are defined depending on whether the Serving GW is unchanged or is relocated. In addition to the X2 interface between the source and target eNodeB, the procedures rely on the presence of S1-MME interface between the MME and the source eNodeB as well as between the MME and the target eNodeB. If the serving PLMN changes during X2-based handover, e.g. you crossed your country boarder, the source eNodeB shall indicate to the target eNodeB (in the Handover Restriction List) the PLMN selected to be the new Serving PLMN. When the UE receives the handover command it will remove any EPS bearers for which it did not receive the corresponding EPS radio bearers in the target cell. As part of handover execution, downlink and optionally also uplink packets are forwarded from the source eNodeB to the target eNodeB. When the UE has arrived to the target eNodeB, downlink data forwarded from the source eNodeB can be sent to it. Uplink data from the UE can be delivered via the (source) SGW to the PGW or optionally forwarded from the source eNodeB to the target eNodeB. Only the handover completion phase is affected by a potential change of the SGW, the handover preparation and execution phases are identical. If the MME receives a rejection to a NAS procedure (e.g. dedicated bearer establishment/modification/release; location reporting control; NAS message transfer; etc.) from the eNodeB with an indication that an X2 handover is in progress, the MME shall reattempt the same NAS procedure either when the handover is complete or the handover is deemed to have failed, except in the case of SGW relocation. The failure is known by expiry of the timer guarding the NAS procedure. If during the handover procedure the MME detects that the Serving GW needs be relocated (this type of HO I will describe later), the MME shall reject any PGW initiated EPS bearer(s) request received since handover procedure started and shall include an indication that the request has been temporarily rejected due to handover procedure in progress. The rejection is forwarded by the SGW to the PGW, with the same indication. Upon receipt of a rejection for an EPS bearer(s) PDN GW initiated procedure with an indication that the request has been temporarily rejected due to handover procedure in progress, the PGW shall start a locally configured guard timer. The PGW shall re-attempt the procedure, up to a pre-configured number of times, when either it detects that the handover is completed or has failed using message reception or at expiry of the guard timer. If the MME receives a rejection to a UE Context Modification Request message with a CS Fallback indicator from the eNodeB with an indication that an X2 handover is in progress, the MME shall resend a UE Context Modification Request message with CS Fallback indicator to the target eNodeB when the handover is complete or to the source eNB when the handover is deemed to have failed. Fig. 2. X2-based handover without SGW relocation. Step 2. The MME sends a Modify Bearer Request (eNodeB address(es) and TEIDs for downlink user plane for the accepted EPS bearers, ISR Activated) message per PDN connection to the Serving GW for each PDN connection where the default bearer has been accepted by the target eNodeB. If the PDN GW requested UE's location info, the MME also includes the User Location Information IE in this message. If the UE Time Zone has changed, the MME includes the UE Time Zone IE in this message. If ISR was activated before this procedure, MME should maintain ISR. The UE is informed about the ISR status in the Tracking Area Update procedure. The MME uses the list of EPS bearers to be switched, received in step 1, to determine whether any dedicated EPS bearers in the UE context have not been accepted by the target eNodeB. The MME releases the non-accepted dedicated bearers by triggering the bearer release procedure. If the Serving GW receives a DL packet for a non-accepted bearer, the Serving GW drops the DL packet and does not send a Downlink Data Notification to the MME. If the default bearer of a PDN connection has not been accepted by the target eNodeB and there are multiple PDN connections active, the MME shall consider all bearers of that PDN connection as failed and release that PDN connection by triggering the MME requested PDN disconnection procedure. If none of the default EPS bearers have been accepted by the target eNodeB, the MME shall act as specified in step 6. Step 3. If the Serving GW has received the User Location Information IE and/or the UE Time Zone IE from the MME in step 2 the Serving GW informs the PDN GW about this information that e.g. can be used for charging, by sending the message Modify Bearer Request (Serving GW Address and TEID, User Location Information IE and/or UE Time Zone IE) per PDN connection to the PDN GW concerned. A Modify Bearer Response message is sent back to the Serving GW. Step 4. The Serving GW starts sending downlink packets to the target eNodeB using the newly received address and TEIDs. A Modify Bearer Response message is sent back to the MME. Step 5. In order to assist the reordering function in the target eNodeB, the Serving GW shall send one or more "end marker" packets on the old path immediately after switching the path. Step 6. The MME confirms the Path Switch Request message with the Path Switch Request Ack message. If the UE AMBR is changed, e.g. all the EPS bearers which are associated to the same APN are rejected in the target eNodeB, the MME shall provide the updated value of UE AMBR to the target eNodeB in the Path Switch Request Ack message. If some EPS bearers have not been switched successfully in the core network, the MME shall indicate in the Path Switch Request Ack message which bearers failed to be established and for dedicated bearers initiate the bearer release procedure to release the core network resources of the failed dedicated EPS bearers. The target eNodeB shall delete the corresponding bearer contexts when it is informed that bearers have not been established in the core network. 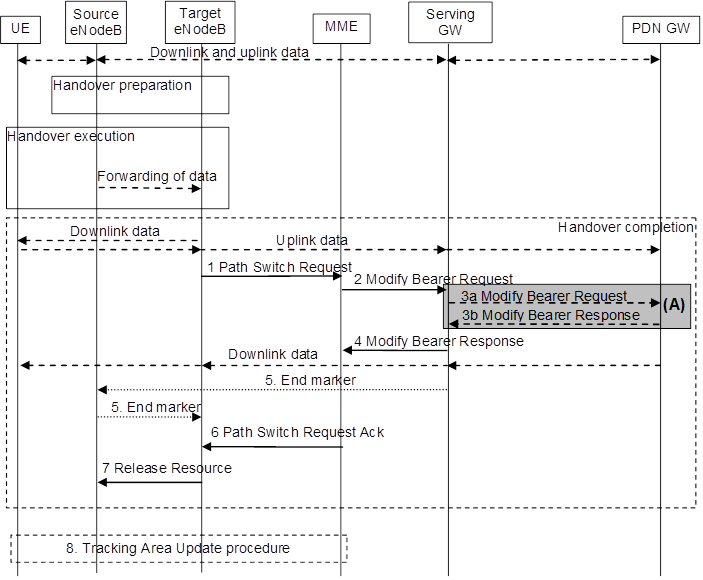 If none of the default EPS bearers have been switched successfully in the core network or if they have not been accepted by the target eNodeB, the MME shall send a Path Switch Request Failure message to the target eNodeB. The MME performs explicit detach of the UE as described in the MME initiated detach procedure. Step 7. By sending Release Resource the target eNodeB informs success of the handover to source eNodeB and triggers the release of resources. Step 8. The UE initiates a Tracking Area Update procedure when one of the conditions listed in clause "Triggers for tracking area update" applies. If ISR is activated for the UE when the MME receives the Tracking Area Update Request, the MME should maintain ISR by indicating ISR Activated in the Tracking Area Update Accept message. great artical on s1 handover.